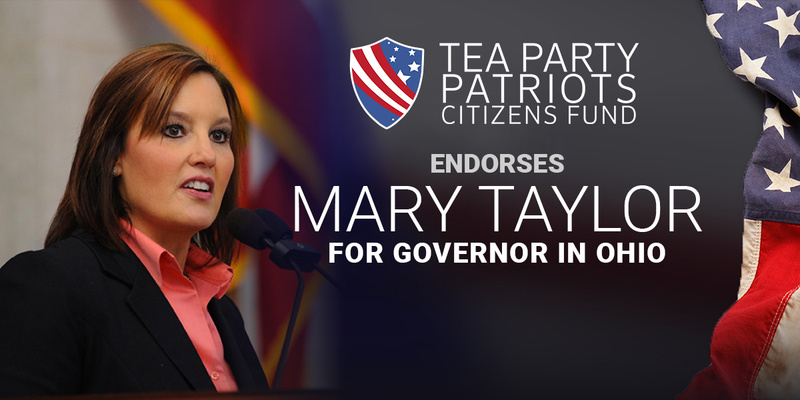 ATLANTA, Ga. – Tea Party Patriots Citizens Fund (TPPCF) Chairman Jenny Beth Martin today released the following statement, announcing that the Super PAC associated with the nation’s largest Tea Party group has endorsed Mary Taylor for Governor in Ohio. “In the contest for the GOP nomination for Governor in Ohio, conservatives have a clear champion – Mary Taylor. “Mary Taylor has been fighting to defend and promote conservative values since she entered public life. Across the broad spectrum of issues facing the Buckeye State, Ohio conservatives know she’s been leading the fight. “Mary opposes amnesty, wants to see President Trump’s border wall built, has vowed to use the power of the purse to shut down sanctuary cities, and will enforce penalties against local officials who don’t enforce the law. “Mary is a strong fiscal conservative. She voted against the Taft tax increase, which resulted in the GOP Establishment kicking her off the Finance Committee in retaliation. As state Auditor, she received the Guardian of the Treasury Award. “Mary has always had an A rating from the NRA. She championed concealed carry in the Ohio House, and voted to override a Republican Governor’s veto. Not surprisingly, she’s been endorsed by all Ohio NRA Board members, Ohio Carry, Ohioans for Concealed Carry, and Gun Owners of America. Tea Party Patriots Citizens Fund is committed to equipping grassroots activists at the state and local level with the tools and resources needed to hold elected officials and government accountable and elect new and qualified candidates. For more information, visit www.teapartypatriotscitizensfund.com.